As you would expect, the New York Toy Fair was a busy event for Mattel. Not only did it show off its updated VR View-Master headset, but it also revealed another product that is a modern reimagining of a classic Mattel toy. This time, it’s the ThingMaker that has been brought back to life, in the guise of an easy to use and affordable 3D printer aimed at children. The original 1960’s ThingMaker let kids (and adults, no doubt) create their own toys by pouring liquid plastic into metal molds. Now, the concept has been updated in the form of a $300 3D printer. While 3D printers are continuing to drop in price, many consumers find them too complicated to operate. 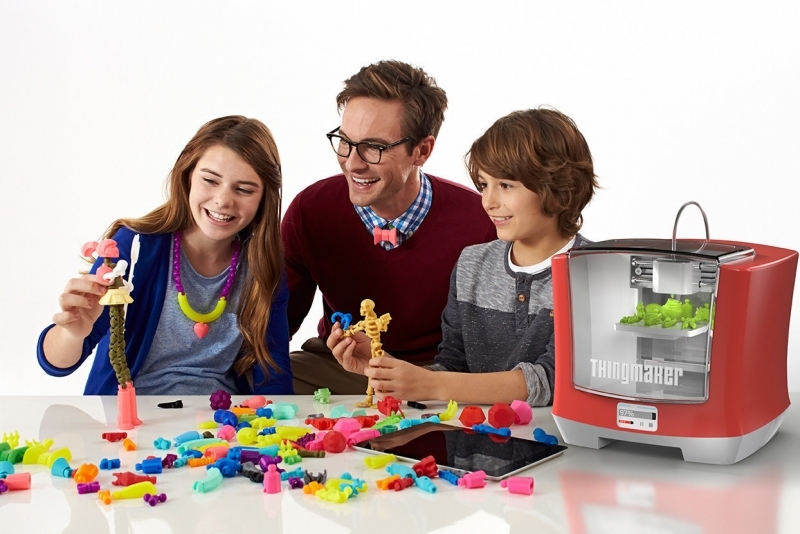 The ThingMaker 3D has been developed in collaboration with AutoDesk to make the 3D printing process easy enough for a child to understand. With the accompanying app (Android and iOS), users can select from dozens of 3D design blueprints and easy to follow tutorials so they can create customizable toys by printing out parts that connect using ball-and-socket joints. You’ll even be able to export the designs wirelessly to any 3D printer, not just the ThingMaker. Once they’ve got the hang of it, kids will be able to design their own toys from scratch and print them out. Mattel noted that "additional design content and branded options" would also arrive for the ThingMaker 3D, which may mean templates for Mattel toys such as Hot Wheels could be made available. The ThingMaker 3D will use a hard PLA filament, and reports say there will be dozens of colors available. A Mattel spokesperson said there may be other materials released in the future. With it being a toy aimed at children aged 13 and up, there are a few safety features to prevent accidents. The doors lock automatically when the printer is in use, although kids can watch the process through the clear window on the front. Additionally, the printing head, which obviously gets incredibly hot, will retract when it’s not being used. The apps for the ThingMaker 3D are already available in the iOS and Android stores, but the printer won’t be available until sometime around late August/September. You can pre-order it from Amazon right now. “We’re going to use these seven months to really learn and gain analytics of how people are using it,” says Aslan Appleman, a senior director at Mattel.